It was Dr. Reuven BarOn, a psychologist, who first coined the term ‘Emotional Quotient’ or EQ in 1985, which is now known as emotional intelligence. His book EQ-I or Emotional Quotient Inventory is a trusted account on everything related to emotional intelligence. If said in simple terms, emotional intelligence can be defined as one’s ability to regulate his or her emotions as well as of others. Since this is an ability that will work best in work environs, employers are looking at emotional intelligence of their employees and a good level of emotional intelligence is also rated as one of the topmost preferred quality in candidates. 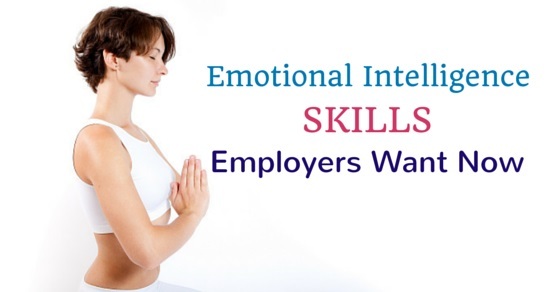 Let us take a look at the emotional intelligence skills employers want now. The ability to work as a team ranks high in the emotional intelligence skills, employers look for. Most of the work in an office needs effective team coordination, and team spirit. If people start behaving egoistically and put self before the team, none of the work will be accomplished well. A consultant said in an interview that he has never fired anyone for inefficiency or lack of skills but that he has fired people who did not possess teamwork. Effective communication abilities are not limited to speaking but also involve good listening skills. The ability to converse clearly helps resolve issues. Good communication skills help in better understanding of each other and clear conversations help keep misunderstandings and thus conflicts at bay. No wonder then, employers look for candidates who can express themselves clearly and effectively. A work environment consists of changing scenarios. Sometimes, team members change or there might be a need to should new responsibilities or there may be a need to abide by new rules etc. The ability to adjust and adapt can help a candidate in gelling with the new environment easily and can cut a positive figure. A work place requires one to be able to strike a positive chord with a wide variety of people, no matter how difficult some might be and this can include customers, colleagues, and others. One should be able to interact smoothly with all of them at all times. Stress and sudden unexpected situations are a norm at most workplaces. Only those will succeed in handling such an atmosphere who can keep their brains calm at stressful situations and is able to think clearly and wisely. This ability goes a long way in solving problems, allaying conflicts and staying calm. A team, a department, or a company works because of reliable employees. Every employer is looking for candidates who they can rely on and who can deliver and who will be available in urgent matters. Such employees can work with or without pressure and are honest and sincere. They meet deadlines and work effectively without tantrums. Employers are looking for candidates who have the confidence and ability to face challenges and meet them with efficiency. It is the ability to think quickly and come out with amicable and practical solutions that are needed to solve problems. Leaders emerge out of such problem solvers. This is also one of the most preferred emotional intelligence skills. The ability to understand others, their problems and reaching out are the qualities today’s employers are looking for. An employee who has empathy for others will be ready to coach colleagues, especially newer ones, so that the team work carries on smoothly. He will also know how to respect other’s time, opinions and working abilities. Workplace requires new ideas and sometimes, the ideas may be accepted and at times, they may not be. This shouldn’t let one get disappointed and that they decide against giving out any ideas at all. Thus employers also rate the ability to share ideas and also the manner in which they accept feedback and work to improvise as one of the key emotional skills. Intelligent discussions are what lead to innovations and breakthroughs. It is a skill that enables one to think well before he or she jumps into conclusions. Employers who look for these skills in candidates can get a fair idea from the social media accounts of prospective candidates. It often happens that on social media, people comment on posts without thinking and some posts are written in weak moments, when they are angry, sad or depressed. Beware, such posts can be inferred by employers of you lacking emotional intelligence. It is important that a candidate has good interpersonal relationships so that he can develop easy camaraderie with members of his team and other colleagues. This leads to effective and smooth functioning of departments, not just the one where the person is working but also the other departments with which he is needed to coordinate. Such a person who understands self well, is aware of his or her limitations and strengths and who is ready to put their strengths to better use and is ready to work on their weaknesses is a great asset for any organization. Such a person is very confident within his or her own skin and can work better and also help create a positive work environment. This is also one of the most important emotional intelligent skills that employers seek. Such people take responsibility work independently and take responsibility for their actions. They do not wait for others to take up initiatives and decisions, resulting in getting things done quickly and effectively. Such a skill can also be referred to as social responsibility skills as it denotes a person’s ability to contribute to social matters as a responsible member of the society and country. Such a person can relate to company goals more sensitively and successfully. This is an important emotional intelligence skill that every professional need to possess, even employers. A person who has good stress tolerance levels can withstand stressful situations effectively and will not be defeated by challenging situations. They are able to manage workloads and are able to meet even unexpected deadlines. This skill enables one to see a silver lining in every dark cloud and looks at the positive side. He is the one who looks at half full glass and not as the half empty one. Such a candidate is the one who believes in self and who believes that anything is possible with effort and action. He is thus able to motivate others also and can work without getting stressed up. It is not just the ability to express that counts but the ability to express non-violently and non-destructively. This skill enables employees to create a friendly and amicable working atmosphere where ideas can be shared and disused with animosity. This skill is a prerequisite to any roles in all organizations. It helps employees to work well to any changing situations and they show consistency in their work due to their flexible attitude as they can change as per situations to get work done. A modern workplace sees many changes and situations that can prop up challenges. A flexible employee can manoeuvre through these occasions to emerge triumphant. This skill enables employees to recognise their self-worth and confidence and thus makes them ready to face any work challenges. Such employees see new work opportunities and projects as exciting ventures and look forward to put in their best. This is a contagious skill that will also inspire and motivate others in the office. This is a skill that a few possess. It is the ability to know that rash behaviour can not only cost them but can also give a bad repute to the company. Such employees are the ones who believe in action rather than reaction and will act only after considerable thought. This skill denotes a person’s emotional satisfaction with life in general and gives out a positive vibe about him. He not only is always in a good mood but lifts the mood and spirits of the whole office too. He enjoys work and helps in keeping the work place positive and happy. The importance of emotional intelligence skills in one’s life can be gauged from the fact that Yale University has introduced a test to identity the emotional intelligence of candidates of management school as an essential admission procedure. There are MBA professors who teach their students to cultivate and learn more about emotional intelligence. In today’s workplace atmosphere where there is competition, struggle and stress, possession of emotional intelligence skills can be very important to manage life and work. It is easy to cultivate the emotional intelligence skills listed above. Practise these every day and soon you will possess the emotional intelligence skills employers want today. Next articleHow to Turn an Internship into a Job Offer?